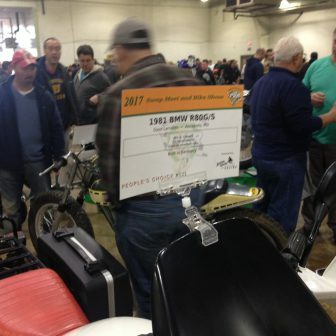 A sea of vendors at the Potomac Vintage Riders Swap Meet and Bike Show. 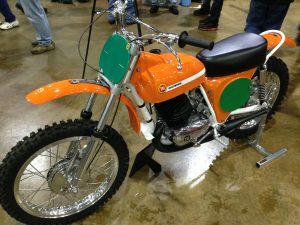 Ossa, Maico, and many other motorcycles were distributed within a couple hundred miles of my home in Harrisburg…and Harley-Davidsons were made about 45 minutes away. 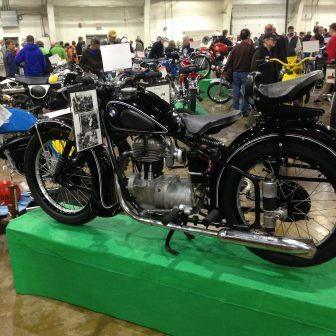 Automobile manufacturers in the early days also thrived here, and steam engines were present in this highly-populated region. 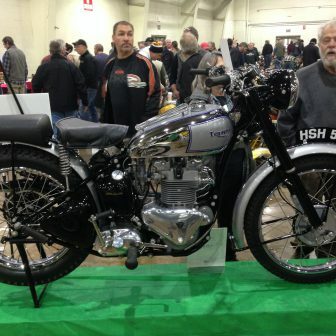 For the ‘motor head,’ there probably is no place like the Northeast. 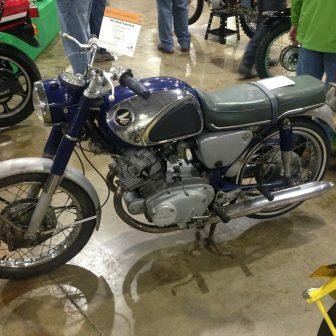 That rich economic history translates into our current plentiful enjoyment of classic motor events (and we won’t even get into the Big Daddy of all great motor events, the annual Fall Hershey meet…). 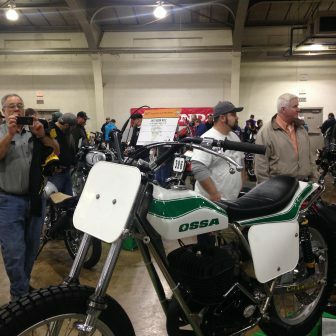 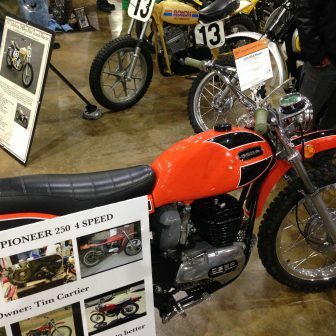 One of these wonderful happenings is the annual York motorcycle show, originally promoted by Will Stoner of Ohio, and, for about the last decade, produced by the Potomac Vintage Riders and the enormous effort of individual volunteers like Allen Brown and Mike Slate. 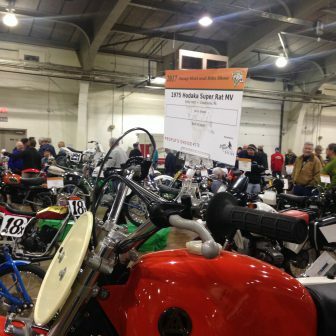 Held at the old York Fairgrounds, in the middle of York, Pennsylvania, the show is just the antidote for the middle-of-winter blues. 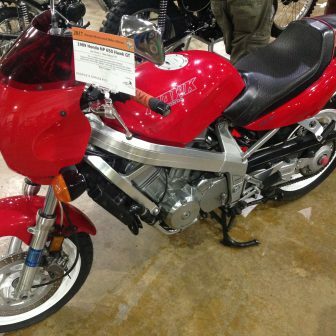 The warmth and excitement of York has given old bikers a boost, just when they needed it, since the mid-1990s. 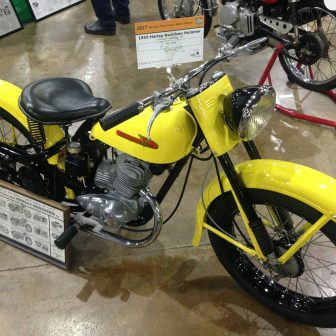 Halfway Mark from July’s Vintage Motorcycle Days – Just a Coincidence? 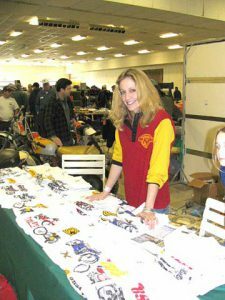 York officially “happens” on Sunday, but much of the best buying-and-selling takes place on Saturday, during set-up—to which only vendors are allowed. 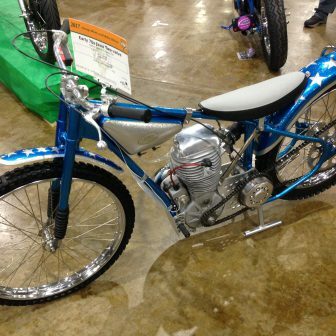 Many of the show bikes will also arrive on Saturday. 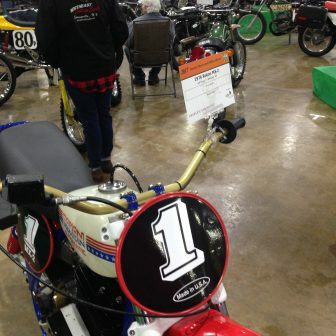 Saturday night features the American Historic Racing Motorcycle Association awards banquet, while others attend parties in and around York that evening. 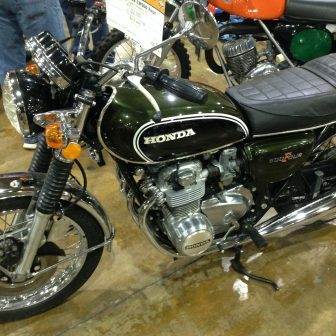 The city of York is easy to navigate, and absolutely a breeze to drive in and through (especially if you’re from the Washington, DC area, Baltimore, or Philadelphia). 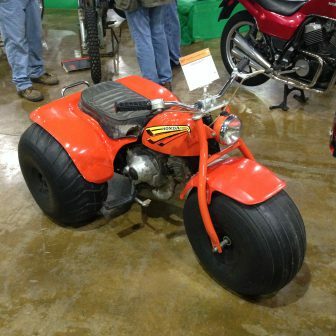 Restaurants and reasonable motels are easy to find. 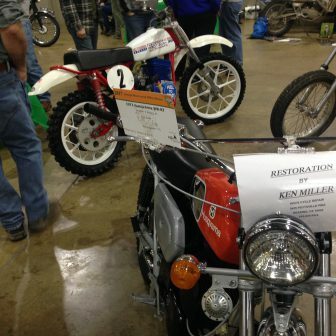 The swap meet (Remember when bikers “swapped” parts for other parts? 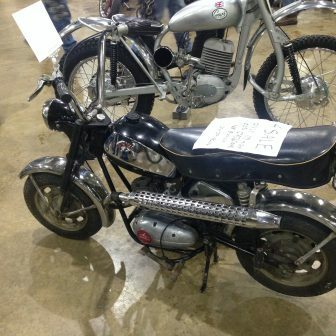 We don’t, either.) 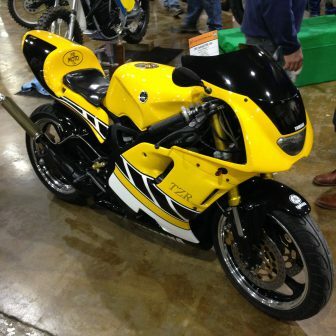 is always good. 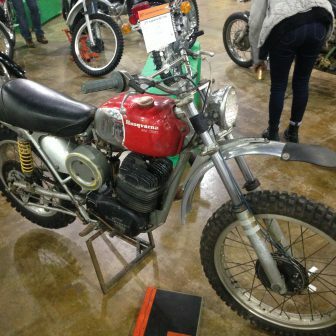 There is a very wide variety of machines and parts for sale, from dirt to street and European to Japanese. 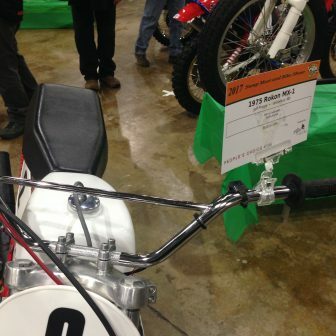 Note that ‘America’ was not mentioned; if you want Harley stuff, there are plenty of other venues for that. 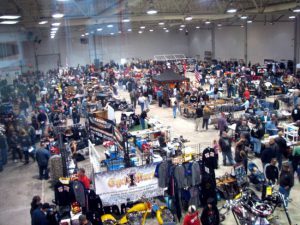 And, devoid of the Harley items (and hard-core elements), York is truly a place you can bring your family and not encounter excessive profanity, too much leather and clothing, and grandmothers with “F**K” written on their leggings (yes; I saw that at my last Harley-only show, 25 years ago). 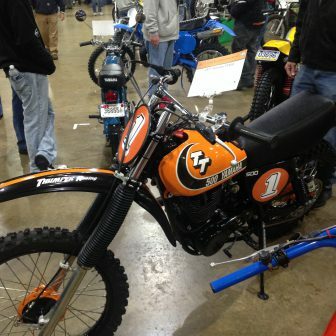 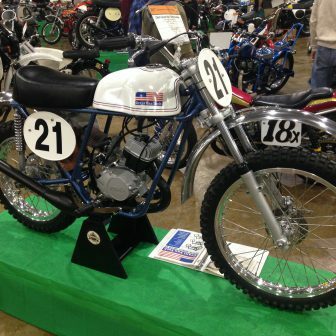 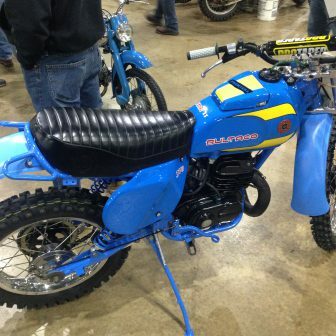 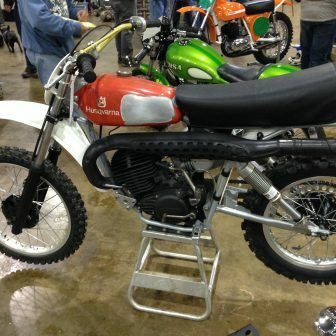 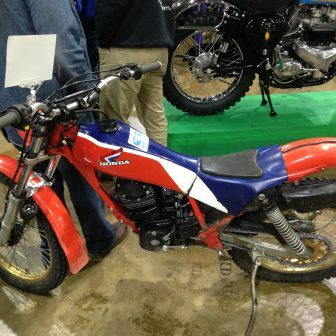 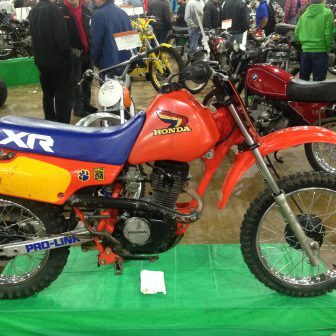 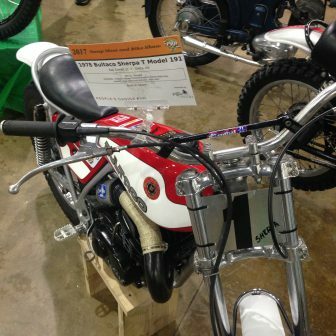 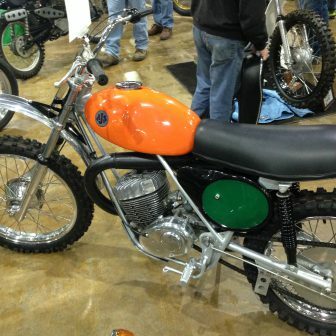 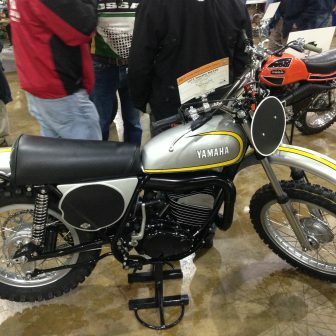 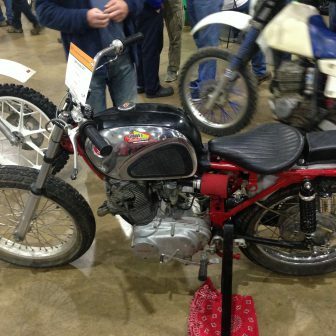 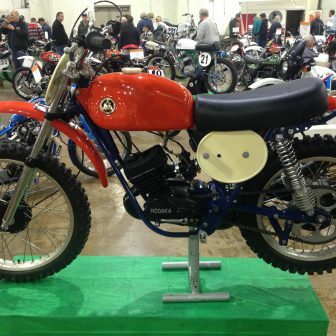 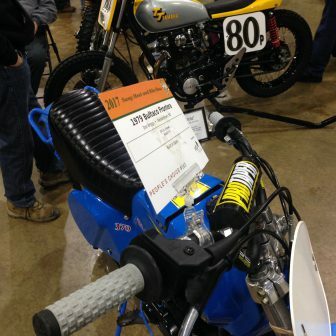 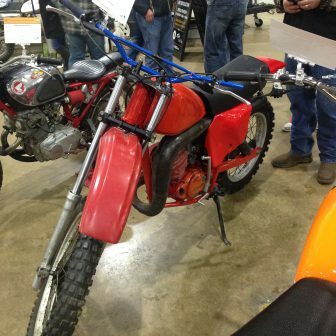 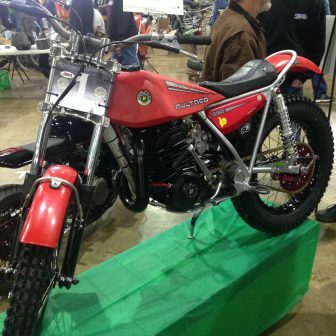 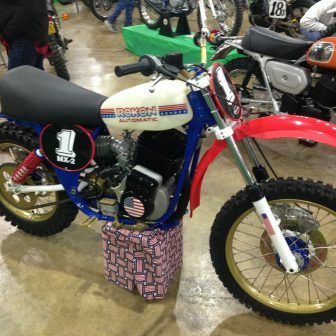 York is an especially good show for the off-road crowd, as they tend to be under-represented at bike shows, in general. 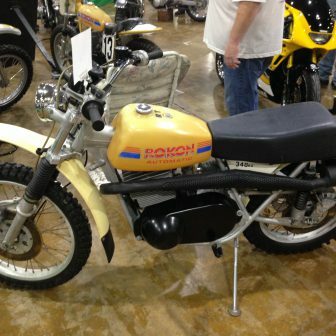 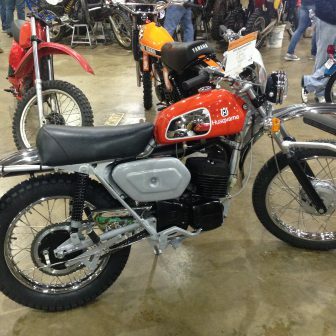 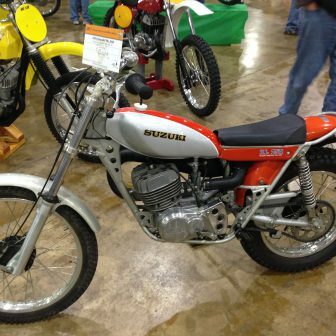 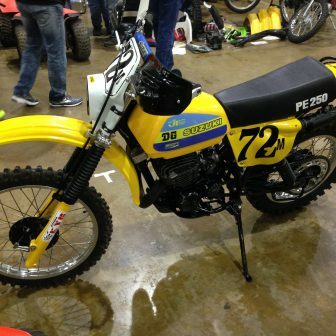 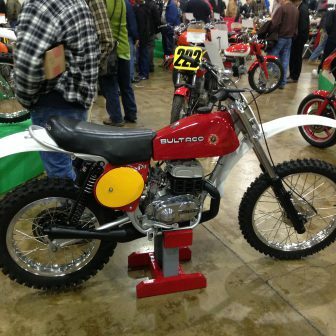 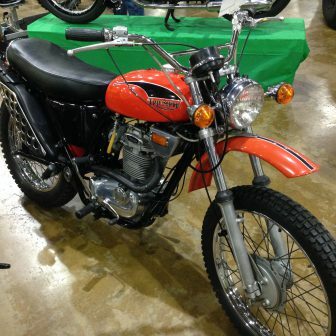 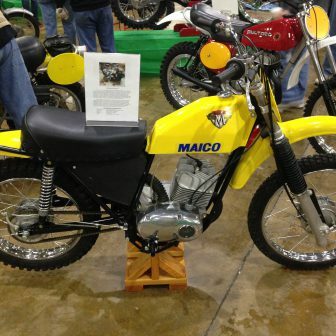 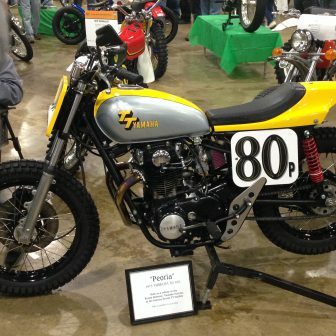 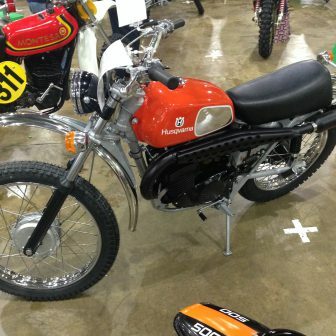 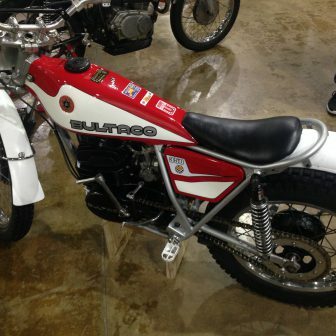 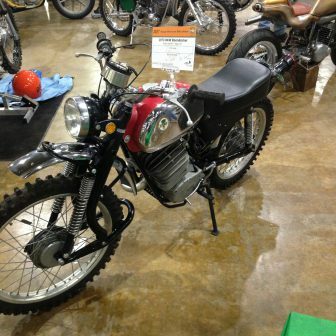 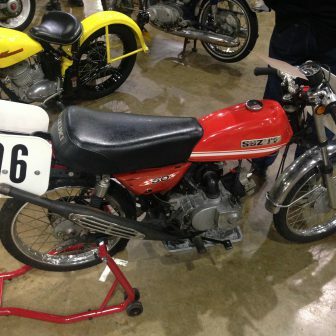 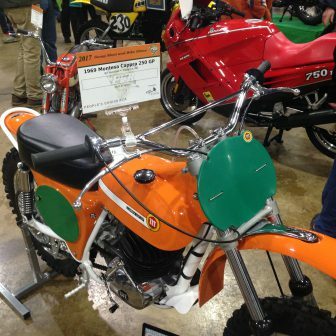 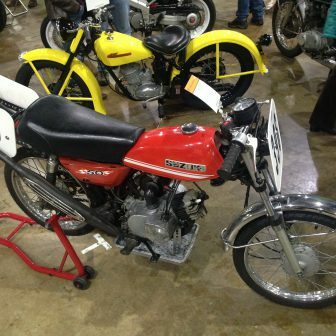 Some of my key sightings at in the swap meet area this year were: a mid-70s Hercules (Sachs) 250 enduro, with locked motor but entirely complete and with minimal corrosion (asking price: $800); some beautiful put-gas-in-and-go ‘74 Suzuki TM-250s and 400s, which went to new homes for less than $2000 each; an adorable pink-and-black leather girls motorcycle jacket ($40); and an array of wonderfully-preserved vintage Hondas for very fair prices. 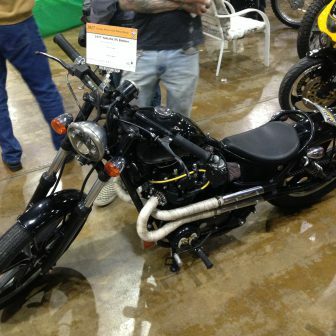 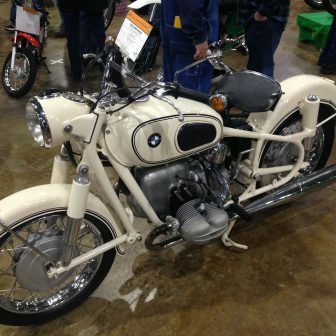 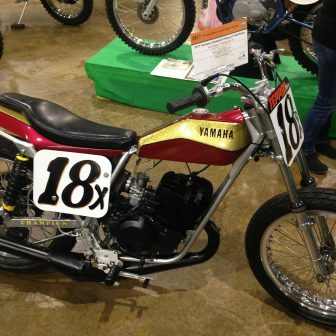 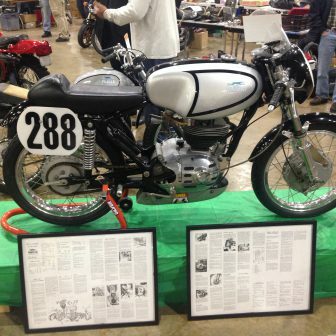 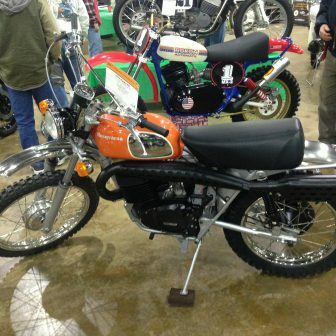 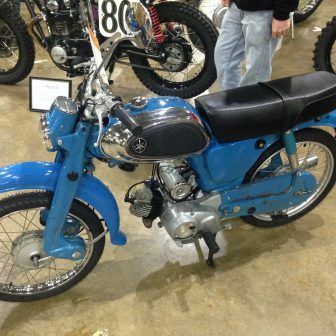 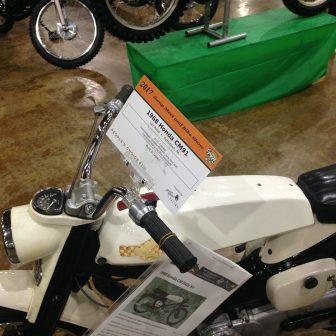 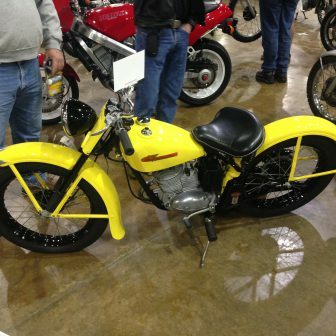 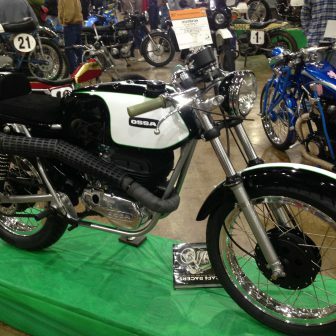 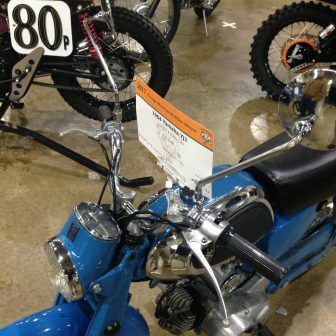 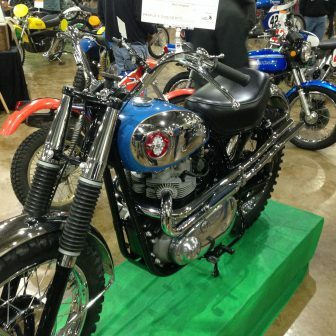 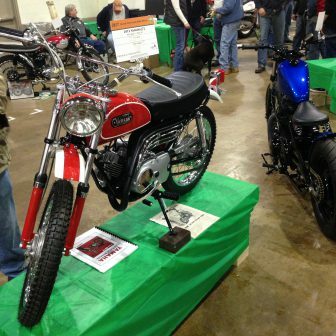 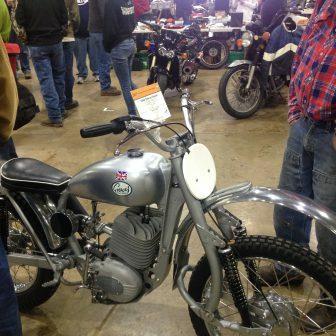 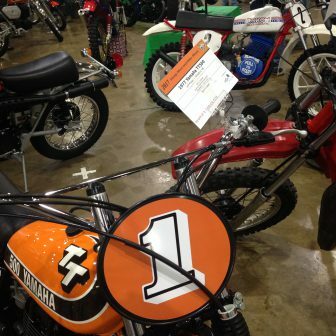 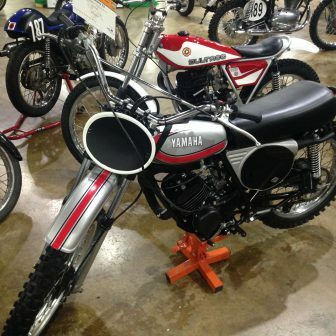 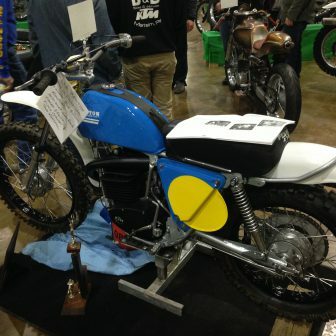 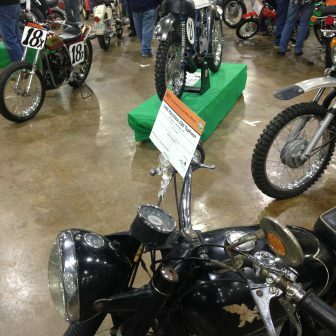 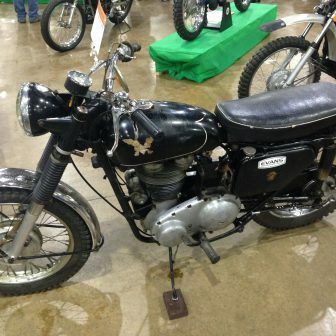 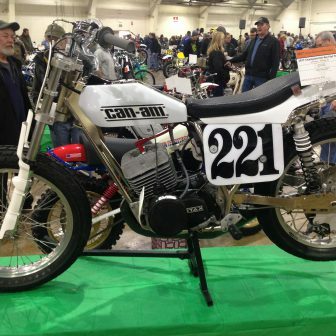 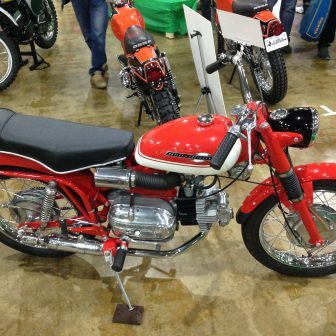 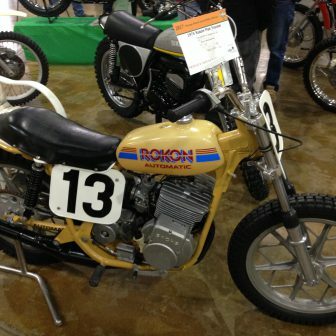 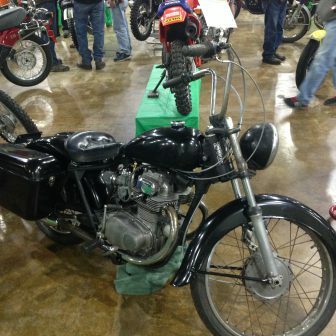 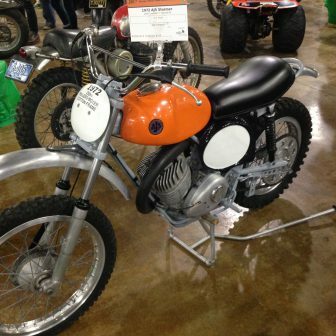 The bike show, also called the “peoples choice”, featured 120 motorcycles (Each of which are captured in the photo gallery below, courtesy the team here at the Vintage Motor Company!). 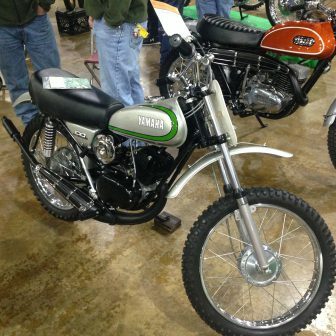 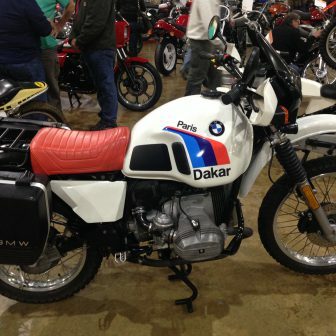 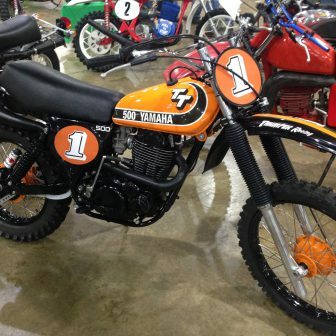 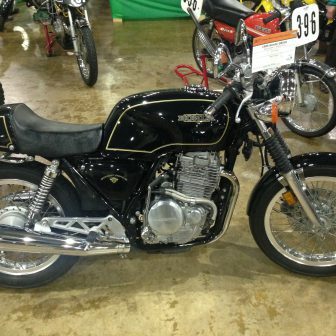 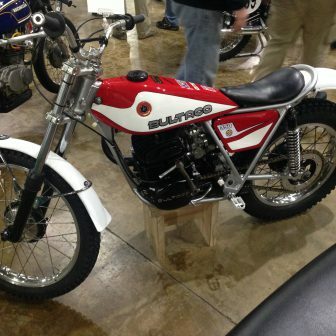 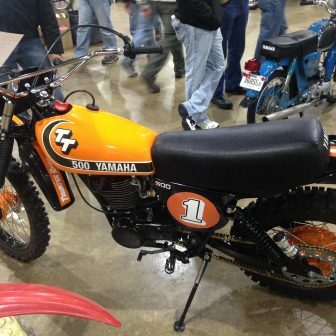 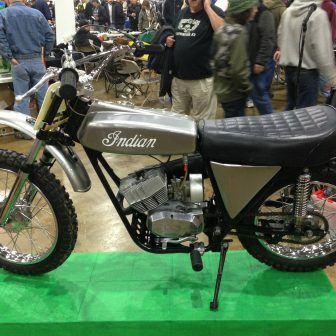 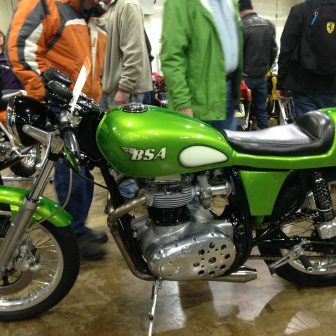 There were several originals and some over-restored machines, but every bike rated your attention. 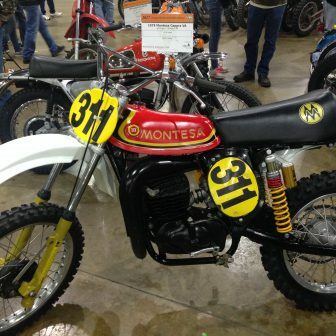 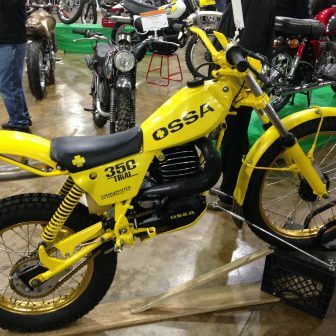 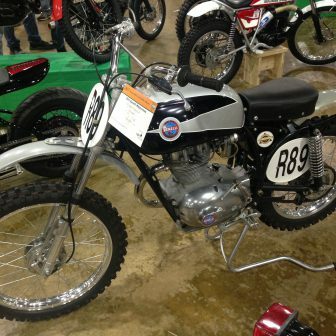 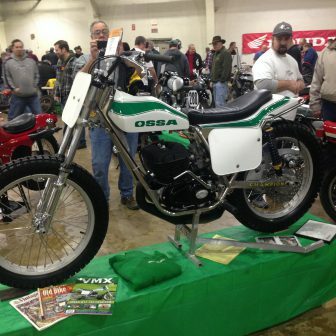 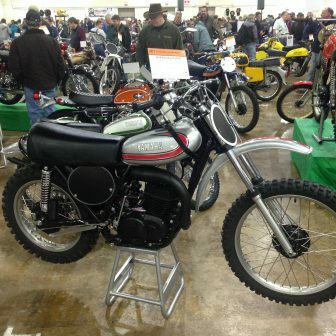 Standouts included a drop-dead-gorgeous BSA “Scrambler” by Bud and Kerry Kubena; a collection of better-than-new Ossas and Husqvarnas, and a circa-1970s Montesa 250 Cappra motocross bike. 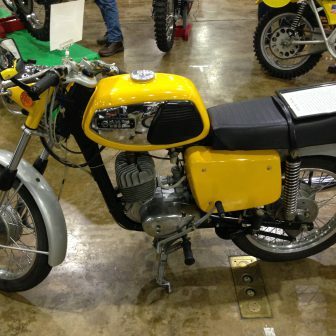 The Cappra caused a number of people to be amazed at its innate beauty, and several noted to me words to the effect of “There’s just something about that Cappra!” Yes, it was over-restored from what its original condition would have been; however, the end product simply would not allow you to look away! 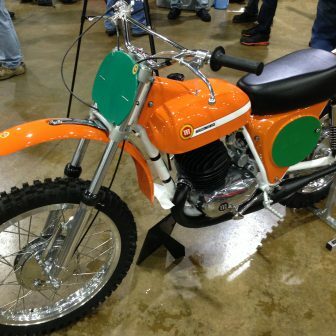 The white frame, contrasting with the orange bodywork and chrome pieces, created a very unique and completely transfixing piece of industrial art. 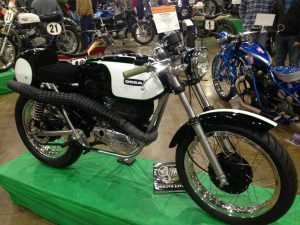 If you’ve never made time to travel to the York motorcycle show (held each mid-January), plan on attending when you can. 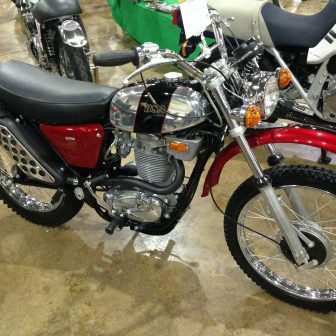 It has become a key motor event for middle-easterners, and deserves its good reputation. 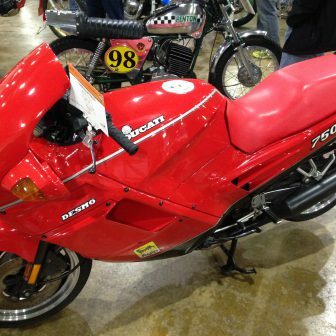 You won’t be disappointed! 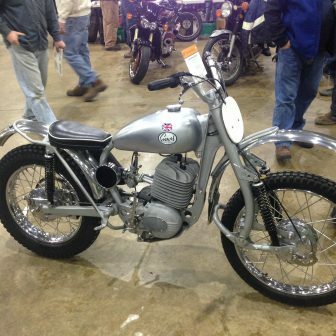 Without further ado, please enjoy the photo gallery below, which includes just about every bike submitted into the bike show this years 2017 event. 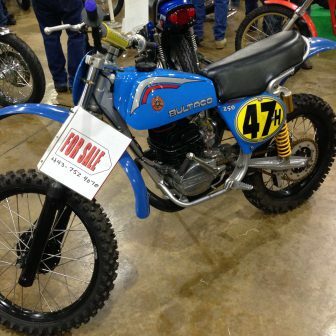 Click on any picture to open the Photo Gallery! 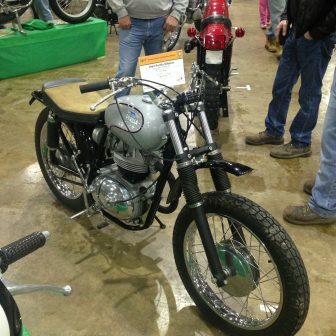 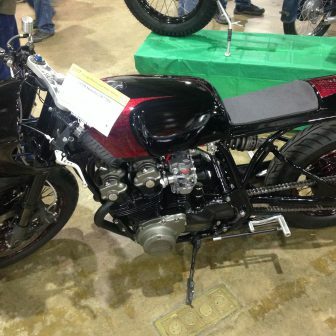 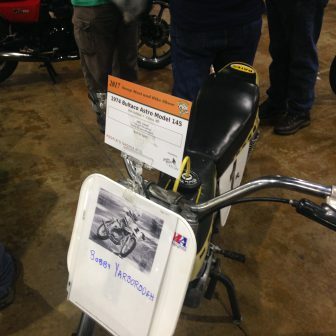 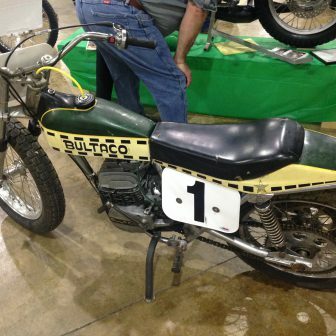 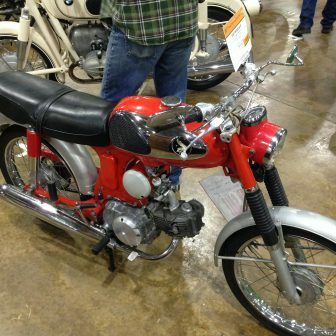 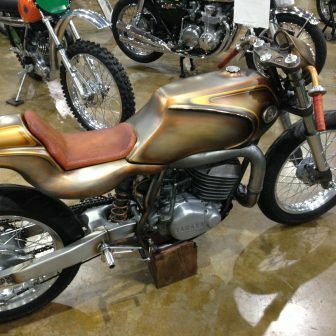 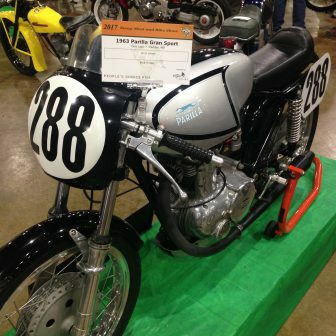 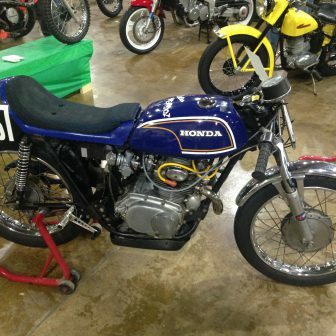 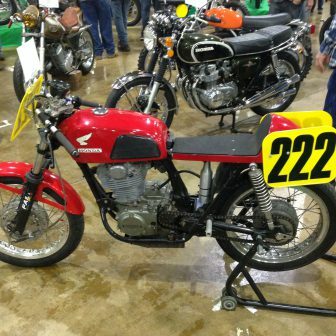 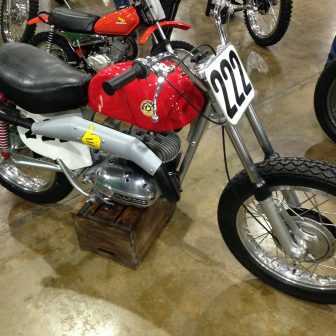 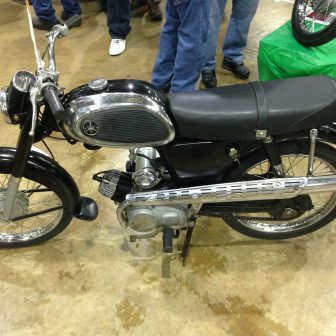 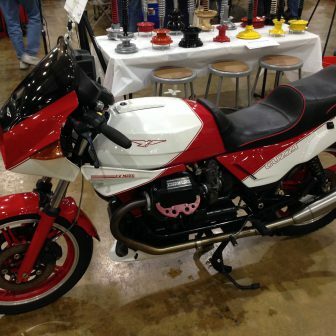 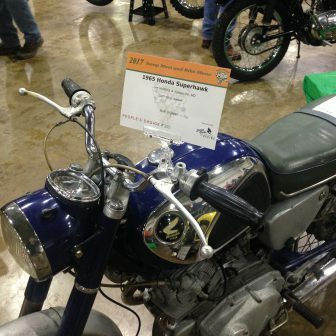 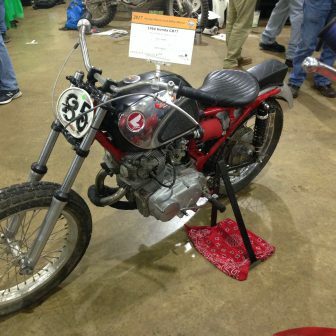 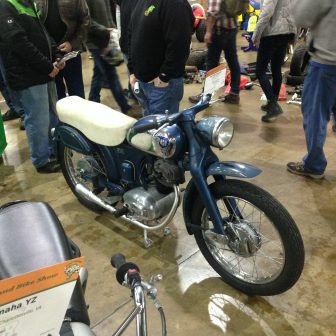 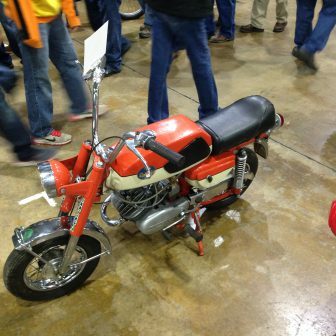 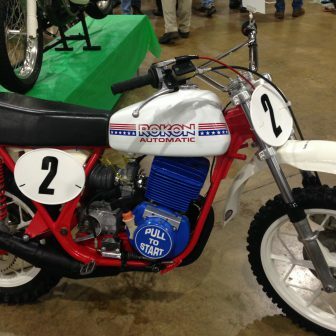 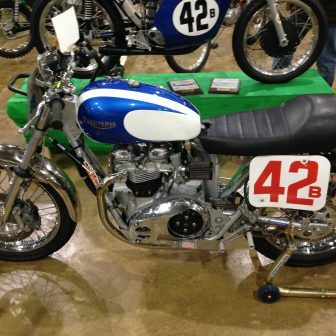 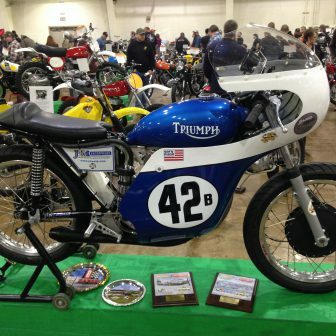 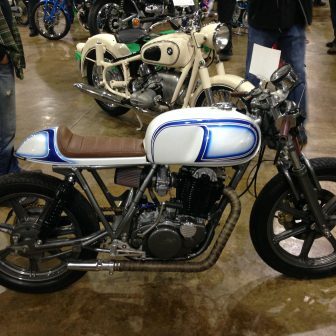 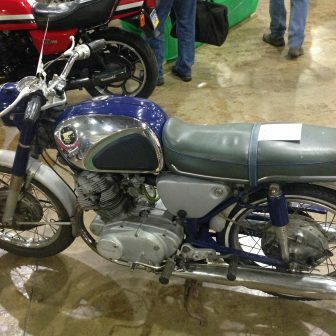 This entry was posted in Motorcycle Culture, Potomac Vintage Riders York Bike Show and tagged The 2017 Potomac Vintage Riders York Swap Meet and Bike Show, Vintage Bike Events. 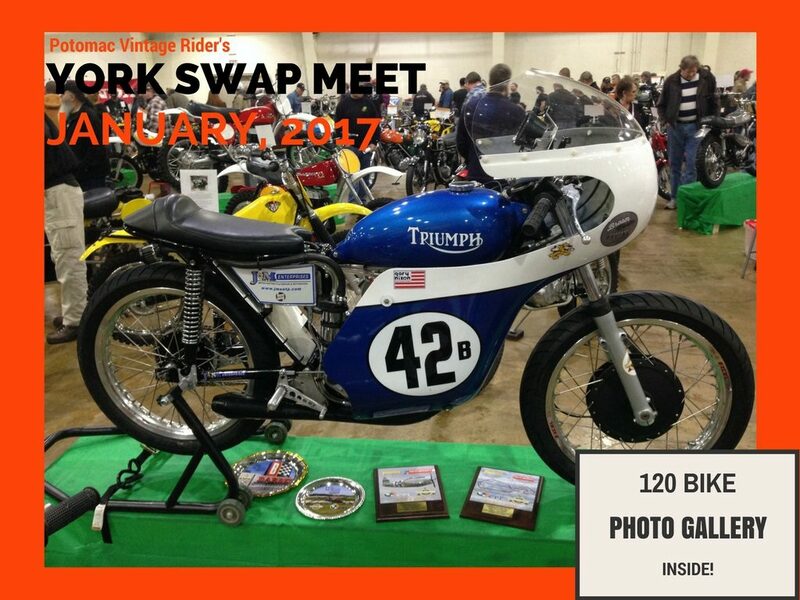 Would like to check out your 2018 swap meets. 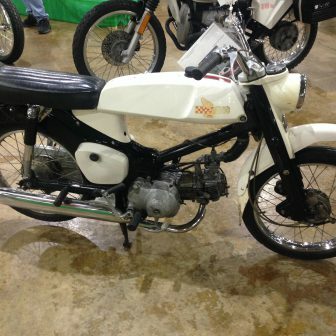 Any suggestions in the northeast or east of the mission!